Nextiva provides business phone services and applications to connect to all of your devices. As an entrepreneur or small business owner improving your customer and employees phone experience should be top of mind. 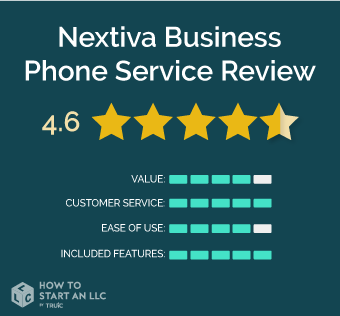 We compared Nextvia to other business phone services and provided an honest review. Nextiva offers a high quality phone service available on all devices such as mobile and desktop devices with apps, and desk phone, and is paid for on a per-user basis. While Nextiva stands out as one of the more expensive options, their customer service is the best rated of all the services we reviewed, and is highly focused on in their marketing, from typical customer support for lower tiers of service to account management and a partnership-style level of support at higher tiers. Who is Nextiva Right for? Nextiva offers unlimited calling plans to anywhere within the US, Canada, Alaska, Puerto Rico, Hawaii as well as remaining US Provinces. Starting at the Office Pro plan, the most basic, Nextiva offers unlimited faxing at no additional cost. Nextiva offers a professional recorded greeting service. With 1-3 available on the Office Pro Plus and Office Enterprise plans. Past this, recordings cost $25 each. Nextiva’s customer support, much like Kixie’s, is one of the best in the industry, with consistently glowing reviews on third-party review sites. Nextiva offers strong integrations with Skype and Microsoft Office, and easy-to-add features such as voicemail-to-text messages, so if this is part of your workflow, Nextiva would be a great addition. While Nextiva’s pricing is the best per-user at high volumes, the lower tiers can cost quite a bit, starting at $34.99/month/user, which is not initially clear on their pricing page. Nextiva offers multiple pricing tiers. The most basic tier is Office Pro, an entry-level plan for teams that are just getting started with phone systems, but still, need an automated menu system. The top tier is Office Enterprise, which offers tools for teams that need to track their phone call activity. Take a look below for the calling features that come with Nextiva, and how each package adds more advanced features such as a mobile app, conference calling, call recording, packages of professionally recorded greetings, and call forwarding. Note that the prices shown in the following screenshot are for plans with many users, with the prices we’ve listed starting at the single user level. Starting at $34.95/month/user, with discounted rates per user based on the number of users + $2.95 per line that use Voicemail to Text, further reduced by an up to a 36-month agreement. Who should purchase Office Pro? Office Pro is best suited for a single person or a small team who just needs a phone system with some advanced features such as Barge in, for managers to check on calls, unlimited faxing, and call menu systems. 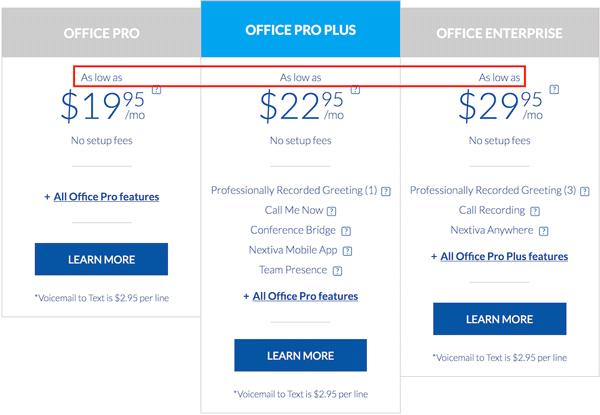 Office Pro Plus starts at $37.95/month/user, with discounted rates per user based on the number of users + $2.95 per line that use Voicemail to Text, further reduced by an up to a 36-month agreement. Who should purchase Office Pro Plus? If your team requires the use of Nextiva’s mobile app on their devices, a conference line of up to 9 people, integration with your website for people to call you directly, and some basic tracking for call history, then Office Pro Plus would be worth considering. Office Pro Plus is best for teams growing outside of the central office, and into specialized roles, such as sales. Office Enterprise starts at $44.95/month/user, with discounted rates per user based on the number of users + $2.95 per line that use Voicemail to Text, further reduced by an up to a 36-month agreement. Who should purchase Office Enterprise? If your team is getting to the point that calls need to be recorded for training or review, Office Enterprise is your best bet. Also, if your team needs to use their phone number from any phone, without the use of their app or smartphone, Nextiva Anywhere helps with call forwarding features. While the features of RingCentral make it easy to set up and use, the cost of each plan to get started reflects that this system’s cost-effectiveness starts showing when many users are added to the system. Nextiva’s overwhelmingly positive customer service ratings show that they take their customer’s experience seriously and want to solve problems for those who choose to go with Nextiva. Because Nextiva is meant to be used by both large and small teams, there are some systems such as the greeting menu auto-attendant, scheduling, and call routing rules that may take some effort to master. With many advanced phone system features available in the lowest Office Pro plan and unlimited calling to the US and Canada, Nextiva makes a powerful tool for solo entrepreneurs, small businesses, and even large companies.